Experience the natural wonder of the Grand Canyon by air and by water on this luxurious 3.5-hour combo tour from Las Vegas. Soar above the canyon’s West Rim in a helicopter, cruise down the Colorado River on a pontoon boat tour, and enjoy a glass of Champagne with a box full of snacks on the riverbanks surrounded by the majestic canyon walls. Admire breathtaking aerial views of the Las Vegas Strip, Hoover Dam, and Lake Mead during the round-trip flight, and travel to the launch pad in style with complementary hotel pickup and drop-off in a limousine. Take a break from the casinos to experience one of Earth’s most impressive natural attractions—and still have time to enjoy an afternoon by the pool. After morning pickup at your Las Vegas hotel in a limousine, ride in style to the launch pad and climb aboard a state-of-the-art A-Star jet helicopter with room for six passengers. Get a fantastic aerial perspective on the Las Vegas Strip as you rise into the air. During the 45-minute flight across the desert and into Arizona, take in views of Lake Mead and the Hoover Dam while learning about the area’s geologic history from your pilot. As the 277-mile (446-kilometer) Grand Canyon comes into view, its awe-inspiring scale can truly be appreciated from the air. Fly above the cavernous expanse, which reaches widths of up to 18 miles (29 kilometers), and then descend more than 4,000 feet (1,200 meters) down the lip of the canyon’s West Rim. After this thrilling entry, touch down on the banks of the Colorado River, which carved the magnificent canyon over millions of years. Enjoy a basket of snacks with a glass of Champagne on the riverbank, and then board a pontoon boat for a cruise down the Colorado River. As you glide along the gentle currents, gaze up at the canyon’s towering walls for an amazing new perspective. After a 15-minute cruise, return to your helicopter and rise up out of the canyon for the return flight to Las Vegas. Your 3.5-hour tour concludes in the late morning with limousine drop-off back at your hotel. 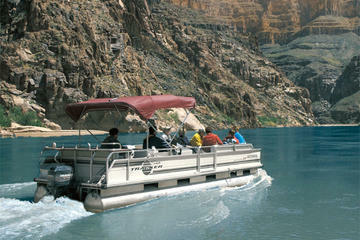 The boat portion of the tour may be cancelled due to high water levels in the Colorado River. In the case of a cancellation, extra time at the base of the canyon will be offered or a partial refund will be issued. The helicopter part is amazing. But the boat tour is very disappointing. Don't waste extra money for it, you will just have to hurry to be squeezed on a boat that will stay very close to the landing area, so no extra sightseeing and no time to enjoy lunch and bubbles. Well worth the early start. Great limo driver, great pilot and great guide on the boat too. Beautiful views and a wonderful experience!!! Thanks to US President Obama - my tour was bit screwed due to flying restrictions in Vegas as he was in town. However Viator helped me salvage fair bit and offered an alternate tour. The ride in the stretch limo and then the Helicopter was fabulous. The marvel of Grand Canyon was out of the world. A bit rushed and rather squashed! A trip to the Grand Canyon was one of the main reasons for visiting Las Vegas. As a geologist I was very interested in seeing the rocks as well as the general scenery. However, we found that the major focus on the tour was keeping to the timetable. Time in the canyon was limited and although we had booked both a picnic and the boat ride there was not time for both - we had to carry our food back to Vegas. Those who just had the picnic were restricted to a small area due to the movement of the helicopters. Pick-up from the hotel was fun - in the stretch limo. The helicopter was cramped though - 3 in the front including the pilot was a bit tight but four in the back was very uncomfortable. The people in the middle obviously have a restricted view. Personally, I think that better scheduling is needed - perhaps some time at the top of the canyon plus real time in the canyon. The boat trip was also a bit disappointing and focussed on the captain taking photos of the tourists in the canyon - I would have preferred to travel a lot more on the Colorado river to see more of the scenery. Overall it was a bit disappointing - not enough time to take in what should be the highlight of our anniversary trip and not really worth the money. It was everything we imagined at would be. Breathtaking scenery, wonderful helicopter flight, and fun river cruise. We would definitely recommend this tour. Excellent, well organised from hotel pick-up, activity and return to the hotel. We did have a hip-cup at the Colorado river, to me had no consequences, allowed me more time to view the wonderful scenery and talk to other people from around the world. Loved it, the scenic views were breath taking and our pilot was great! Would have liked new time to enjoy our breaky and champagne however, it felt a little rushed. Just sit back relax and enjoy! !